Charlie Strong is 16-20 in three seasons with the Longhorns. Over in the football office, “We are getting ready for TCU,” one source said. Texas closes out the regular season by hosting TCU at 2:30 p.m. Friday. 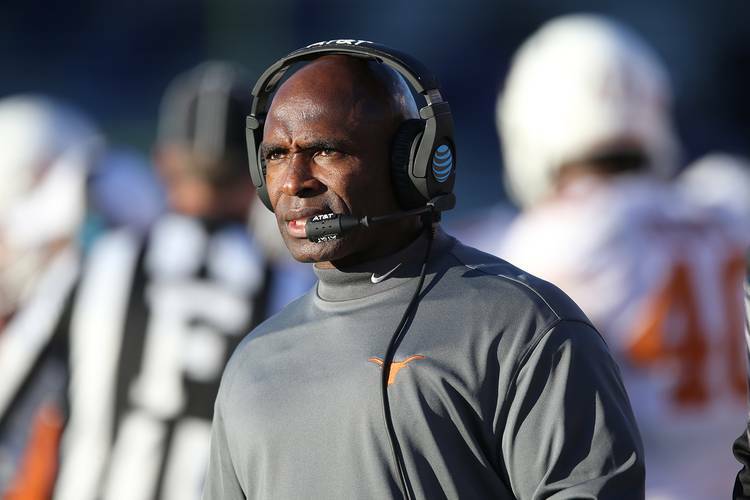 University of Texas officials have decided to fire football coach Charlie Strong, a high-ranking university source told the American-Statesman. The decision comes after Saturday’s shocking 24-21 overtime loss to Kansas, a team that had lost 19 straight Big 12 games. “It will happen for sure. The question is when,” the source said. However, Texas athletic director Mike Perrin issued a statement about 6:30 p.m. Sunday saying there were “rumors out there” about Strong’s status. Perrin refused to comment about Strong’s situation after the Kansas State loss on Oct. 22. “No talking,” he said. Then, Perrin declined to comment when approached by reporters after Saturday’s loss in Lawrence. Strong is 16-20 in three seasons with the Longhorns and may become the first coach to oversee three consecutive losing seasons since 1936-38. He currently has the lowest winning percentage of any coach in UT football history and is 5-10 against ranked opponents in three years. Strong is scheduled to meet reporters at his weekly press conference at 11 a.m. Monday as Texas (5-6, 3-5 Big 12) prepares for its regular season finale against TCU. A source told the Statesman that Strong is expected to coach against the Horned Frogs. Texas President Gregory L. Fenves could not be reached on Sunday and did not respond to text messages from the Statesman. Asked when an official announcement could come, “Perhaps in the morning,” the source said. Strong has two years remaining on a guaranteed contract worth $10.7 million. Two athletic department sources said the coaching staff was busy Sunday preparing for Friday’s game. “We are getting ready for TCU,” one source said. Strong appeared to know the end was near after Saturday’s loss. In a somber four-minute press conference, Strong’s voice almost cracked when he was asked what the loss means for his status. “No idea,” he said. Strong’s wife, Vicki, was holding back tears in the cramped media room inside Memorial Stadium. Men’s athletic director Mike Perrin declined to speak to reporters afterward. Several players, including defensive lineman Poona Ford and Charles Omenihu, were seen collapsing on the field. Some players were crying in the locker room afterward. “What you do is go hug ’em and look ’em in the eye, tell ’em to keep battling,” offensive coordinator Sterlin Gilbert said during the post-game press conference. UT officials are expected to target Houston coach Tom Herman as a possible replacement. According to Houston sources and those familiar with the coach’s thinking, Herman would have “strong interest” in the position. University of Texas officials determined weeks ago that football coach Charlie Strong would be allowed to coach all 12 games this season win or lose. Despite Saturday’s stunning loss to Kansas, UT President Gregory L. Fenves and Athletic Director Mike Perrin decided to stick with that plan, a source familiar with both officials’ thinking told the American-Statesman late Sunday. Fans may be demanding finality on Strong’s status, and the coach may want it, too. However, both Fenves and Perrin still view the 18-to-22-year-old players as student-athletes and do not want them believing their on-field play was the sole reason Strong may be fired, the source said. “Fumbling is not apart of my role and in my opinion it’s the reason we lost,” running back D’Onta Foreman tweeted shortly after the game. Other UT players tweeted their support for Strong on Sunday once the American-Statesman, citing a high-ranking university source, reported that school officials have made the decision to fire the coach. While its noble that Perrin and Fenves want to protect their players, the ones on the field shoulder some of the responsibility, too. Strong is 16-20 in three seasons with the Longhorns. “At some point the players gotta be responsible man,” former UT cornerback Quandre Diggs tweeted Sunday. “I guarantee you Strong gave them everything they needed to succeed. “Strong didn’t turn the ball over 6 times.. he didn’t get the field goal blocked.. at some point the finger pointing has to go to players!,” Diggs added. Thus, there will likely be no final announcement about Strong until after Friday’s TCU game, the source said. A press conference will likely happen on Saturday. UT officials are aware that Strong’s press conference at 11 a.m. Monday could be awkward. The 30-minute question-and-answer session is broadcast live on Longhorn Network. Perrin is not expected to attend, a source said. Contact Kirk Bohls at 512-445-3772. Email kbohls@statesman.com.